With hockey’s greatest team trophy on the line, these seven players (there’s a five-way tie for third spot) represent the top regular season game-winning goal leaders on teams that are in the 2017-18 Stanley Cup Playoffs. If you’re looking for a player to net the playoff winner, keep tabs on this impressive group of seven. How do you celebrate the final game of the regular season if you’re Nathan MacKinnon? You score what stands as the eventual game-winning goal in Colorado’s 5-2 home win against St. Louis, and an assist and play a huge role in helping your team grab the final playoff spot in the Western Conference. 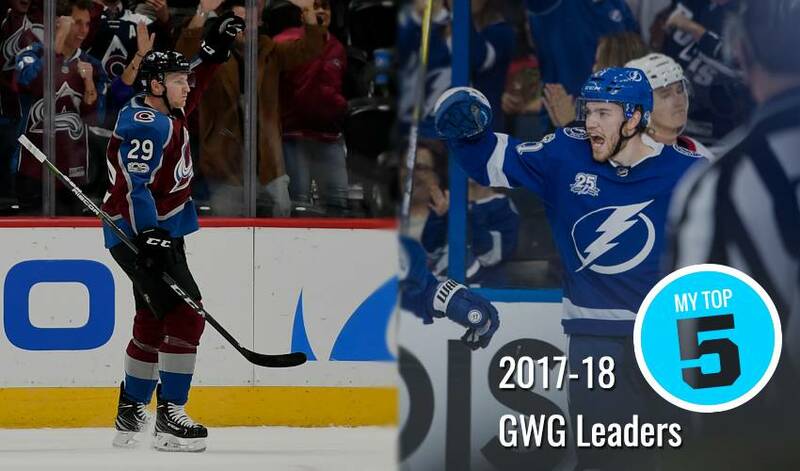 The Calgary native delivered a big-time jolt to the ‘Bolts in 2017-18, scoring 32 goals and recording 66 points. Along with his dozen game-winning tallies, Point had five power-play markers along with three short-handed goals. The fantastic Finn was stellar in his sophomore season, bulging the twine 44 times to go along with 70 points. Twenty of his goals came while the Jets were on the power-play, the most of any player in the League. Averaging 1.25 points per game, the 29-year-old Marchand scored 34 goals and recorded 85 points for the Bruins in 2017-18. The left wing also scored eight power-play markers and fashioned a +25 rating. Washington’s centre never passes up an opportunity to set up a teammate for a scoring chance, but Kuznetsov is certainly no slouch when it comes to lighting the lamp. This season, he scored 27 goals, including seven on the power-play. Nylander capped off his regular season with six points in his final five games, including a two-goal, three-point night against Buffalo in a Toronto 5-2 win. Five of his 20 goals came via the power-play. Henrique’s first period goal against Arizona on April 7 proved to be the game-winning tally in a 3-0 Ducks win. Traded from the Devils to the Ducks in November, the Ontario native finished the season with 24 goals. He ended his campaign with five points in his last five games. Find out why Winnipeg Jets teammate Connor Hellebuyck and streamer Ninja make the cut in Patrik Laine's Player Q&A!